Remains of Homo Erectus, which lived around 500,000 BC were found in caves of Lang Son and Nghe An provinces in Northern Vietnam. This archaeological discovery reveals not only how extensive humanity has spread all over the planet, but reveals ancient ancestors already settling around Vietnam. Humanity would eventually evolve into modern humans otherwise known as Homo Sapiens and will soon give birth to the dawn of civilization. Ancient Vietnam started in the north where various ethnicity lived in close proximity to each other as different tribes and villages. Loc Tuc would eventually become a tribal chief where he united every one in the vicinity, and became Kinh Duong Vuong as their ruler. The new united region was called Xich Quy and started the Hong Bang period. Throughout this period, the region would change the name from Xich Quy to Van Lang. Evidence has pointed out that life during this time was matriarchal or women had significant influence to the family. 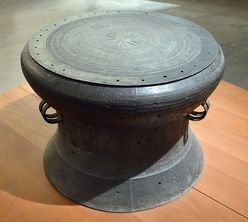 One of the defining factors of this period of Vietnamese history is the Dong Son culture where large bronze drums were made. As an interesting fact from this period, prince Lang Lieu won the rights to the throne by winning a culinary contest with his banh chung. Another Viet group formed between the Au Viet and Lac Viet where Thuc Phan was the ruler. The people eventually mixed with Van Lang where Thuc Phan defeated and overthrew the Hung Kings. He then combined the people as one and changed the name of the region from Van Lang to Au Lac. Warlord Trieu Da eventually defeated Thuc Phan by having his son Trong Thuy be a spy and marry Thuc Phan's daughter. Trieu Da acquired Au Lac and renamed the region to Nam Viet. During this period, the Chinese civilization conquered Nam Viet and controlled the region for about 1000 years. Every so often, revolts would break out in an attempt to regain autonomy and independence. One of the most famous revolts were led by the Trung Sisters where they recaptured 65 states and became their queens until their defeat by a Chinese general. 200 years later, another woman by the name of Trieu Thi Trinh would lead another revolt but failed to be as successful as the Trung Sisters. During this time Vietnam would change its name again from Nam Viet to Annam then to Tinh Hai Quan. The Vietnamese finally regained their independence after Ngo Quyen defeated a Chinese invasion fleet at the battle of Bach Dang. Throughout this 1000 years of rule, the Vietnamese people managed to retain their identity yet at the same time integrated a lot of Chinese culture. This was also the time where Vietnam first encountered Westerners with the arrival of merchants from the Roman Empire in 166 AD. During this time, a lot of warlords fought for the throne after Ngo Quyen's short reign. Dinh Bo Linh would eventually be successful to unify the country once again, beacme Emperor Dinh Tien Hoang, and founded the Dinh Dynasty where he renamed the country from Tinh Hai Quan to Dai Co Viet. Unfortunately, he was assassinated along with his successor which left his 6-year old son to take the throne. Seeing the opportunity to conquer Vietnam once again, Song China launched an invasion. A council quickly decided to appoint Le Hoan to take the throne and he successfully defeated the invading force. During his rule, he started to expand Vietnamese territory south by invading the Champa Kingdom. When a young emperor died, Ly Cong Uan was elected to be the next ruler and founded the Ly Dynasty. He moved the capital to present-day Ha Noi and called it Thang Long which means ascending dragon, and changed the name of the country to Dai Viet. Emperors throughout the Ly dynasty focused on building a strong economy by building many infrastructure projects, promoting education, established humane treatment of prisoners and appointed women to noble roles. At the same time, Vietnam faced border disputes with the Champa and frequent threats of invasion from the north. During this time, Buddhism was highly promoted yet religious freedom was maintained along with Confucianism and Taoism. During this time, Vietnam had a special visit from Marco Polo in 1292. Through marriage arrangements, Tran Thu Do helped established the Tran Dynasty and ousted the Ly Dynasty. During their rule, they faced 3 Mongolian invasions from the north and managed to repel all three. At the same time, the Tran Dynasty faced continuous border conflicts with the Champa in the south. The continuous fighting eventually made Vietnam broke and tired. Eventually, the Tran Dynasty was forced to resign where Ho Quy Ly became the next ruler and changed the name of the country from Dai Viet to Dai Ngu. Weakened by war, Vietnam was soon conquered by the Ming Dynasty from China and overthrew the Ho Dynasty. 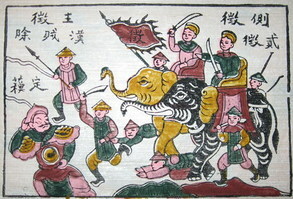 Resistance against Ming rule continued where Le Loi led a successful uprising and pushed foreign soldiers out of Vietnam, thus forming the Le Dynasty. Throughout their reign, the Le dynasty made efforts to rebuild the national economy and successfully conquered the Champa Kingdom. The expansion continued as Vietnamese armies took control of the Mekong Delta from a weakening Khmer Empire. Mac Dang Dung overthrew the Le dynasty where Nguyen Kim and Le Trang Tong started a revolt to reestablish the Le Dynasty. A civil war ensued between the North where the Mac held control against the South. Nguyen Kim was mysteriously assassinated where Trinh Kiem took power. Nguyen Hoang then moved to the edge of the South to avoid any potential further assassinations. After a long struggle, Trinh and Le both defeated the Mac Dynasty where the Trinh lords held power. 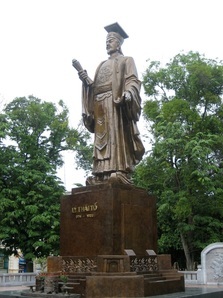 Nguyen Hoang declared himself a lord where him and his successors refused to recognize the Trinh lords and would only acknowledge the Le Kings. The conflicting views eventually led Vietnam to another civil war between the North and South. The conflict enabled Europeans to support both sides of the conflict where the Portuguese helped the Nguyen in the South while the Dutch helped the Trinh in the North. The two sides would fight to a stalemate where they formed a truce which ultimately divided Vietnam into two. During the time of peace the Trinh lords focused on building up the economy while the Nguyen finished their conquests to acquire Cham and Khmer lands. Throughout this time period, Europeans missionaries introduced Christianity to Vietnam and were successful in converting many Vietnamese. However, since Christianity opposed the worship of ancestors, Vietnamese leaders began to view Europeans and Christianity as a threat. In 1771, the Tay Son revolution led by Nguyen Nhac, Nguyen Lu and Nguyen Hue (non-affiliated with Nguyen Lords) overthrew the Nguyen lords and took over South Vietnam. They soon marched north and defeated the Trinh Lords where Nguyen Hue proclaimed himself Emperor Quang Trung. The other two ruled central and south Vietnam while Quang Trung controlled the North. Once Quang Trung passed away, fighting broke out again but this time between the two remaining brother for control over Vietnam. Taking advantage of the opportunity, the surviving prince from the Nguyen Lords, Nguyen Phuc Anh manages to defeat everyone else, finally reunifying Vietnam and declared himself Emperor Gia Long. Much of Nguyen Anh's success of reunifying the country can be attributed by French military support. The Nguyen dynasty made efforts to rebuild infrastructure and the economy. While Nguyen Anh was very open towards Westerners and tolerated Catholicism, his successors were more brutal, conservative to Confucian ideals and resisted Westernization. Many Catholics were persecuted after a revolt was started by a French Missionary and Catholic Vietnamese. This would eventually give France a reason to invade Vietnam. 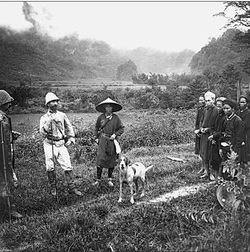 After a long military campaign, French forces took control of Vietnam, Cambodia and Laos to form French Indochina in 1887. The Nguyen Dynasty was still allowed to rule over Vietnam but had to follow French requests. At the expense of hard Vietnamese labor, France exploited Vietnam's natural resources, most notably rubber. Despite France modernizing Vietnam with railroads and other technology, many Vietnamese resisted French authority and rebelled. Many young Vietnamese were sent to Japan and other Westernized countries around the world in order to bring knowledge back in hope to gain independence for Vietnam. One individual, Phan Chau Trinh pushed for a peaceful transition and promoted education for all of Vietnam. Many groups and organizations rose and fell throughout the resistance movement. This was also a time where the Vietnamese language adopted letters instead of characters. 1940-1945 During World War II, Japan invaded Vietnam and the rest of Southeast Asia where the French still retained control. Vietnamese resistance movements still persisted and a famine broke out between 1944-1945 which starved the Vietnamese people and led to many deaths. 1946-1954 France and Vietnam went to war once again as France tries to regain its colonies after the Allied victory in World War II. Vietnam would finally defeat the French at the Battle of Dien Bien Phu and the 1954 Geneva Conference basically left Vietnam divided into two nations. 1954-1975 Vietnam would go through another civil war which results in millions of people dead. Towards the end of the conflict, the Communist North defeats the Democratic South. 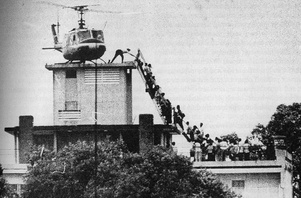 Saigon fell on April 30th, 1975 and is remembered as Black April. Hundreds of thousands of Vietnamese fled their homeland where a large majority settled in the United States. As the new generation of Vietnamese Americans begin their lives, the origins of VSA started.